The Emerging Voices Award was created in 1982 by the Architectural League of New York to showcase the work of early- to mid-career American architects, landscape architects, and urban designers. 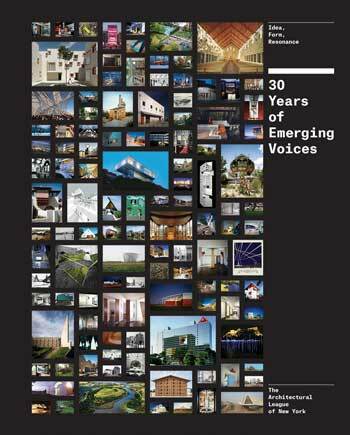 Each year, through an invited competition, a jury selects practitioners or firms with a “significant body of realized work that represents the best of its kind and has the potential to impact the future of architecture and landscape design.” 30 Years of Emerging Voices: Idea, Form, Resonance, a new book by the Architectural League of New York, documents and assesses the first three decades of the League’s Emerging Voices program, highlighting firms that have been recognized for their innovation, insight, and influence. Organized chronologically by year of submission and interspersed with essays by leading design critics, this book is a true reference, valuable as a comprehensive snapshot of the past three decades of design. The Emerging Voices award is unique in that it recognizes professionals who are no longer students, but are not yet “fully mature practioners.” As Ashley Shafer, an associate professor of architecture at the Ohio State University, states in the book’s first essay, this career phase often gives way to work that is “idealistic, experimental, and formally clumsy on occasion.” While some of the work in the book may have been “dismissed as hypothetical, utopian, or even naïve,” it’s work we now look at with appreciation. Take for example Steve Holl’s Bridge of Houses proposal for the then-abandoned High Line in Chelsea, Manhatttan, which was recognized among several of Holl’s other projects with the 1982 Emerging Voices Award. 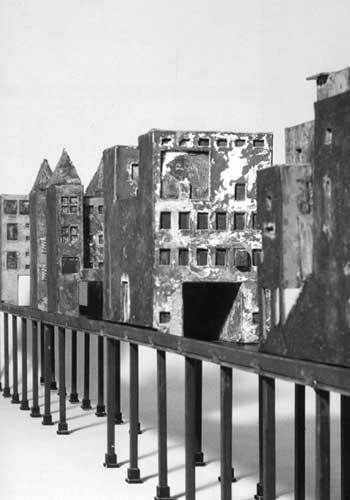 The firm’s proposal for the disused High Line was to construct many different houses over the rail. Each villa is, in itself, a slightly different looking bridge that provides pedestrian passage. 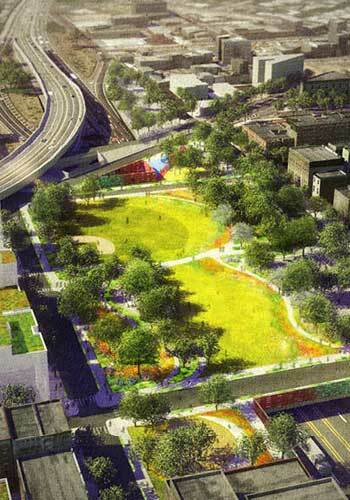 While the ambitious project was merely conceptual, it served as a precedent for James Corner Field Operations’ High Line park, which was recognized with the award in 2001 and is also featured in the book. While seemingly unrelated projects, “a host of newly created buildings” engage the High Line as was intended by Holl almost two decades earlier. The same phenomena is true of Reiser + Umemoto’s 1995 design for Yokohama’s International Port Terminal, which was recognized by the Architectural League of New York in 1996. The complex network structure for the building seemed fantastical and impossible to construct at the time of its conception. 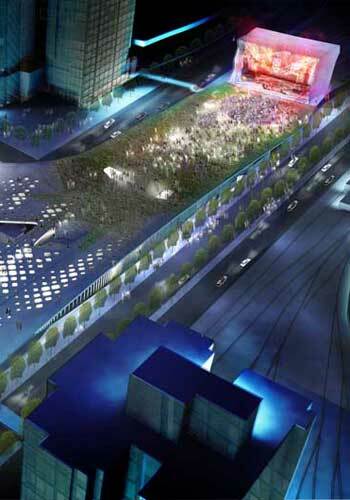 However, Jesse Reiser and Nanako Umemoto’s Taipei Pop Music Center, which is arguably just as structurally complex as their design for the International Port Terminal, is currently under construction. While many of their ideas were considered outside the realm of possibility in the mid-late 90’s, Reiser + Umemoto’s designs became not only feasible, but well-received, at the turn of the 21st century. While the majority of the book is devoted to architects, several landscape architects are also featured, including Susannah Drake, FASLA, Dlandstudio; Chris Reed, FASLA, Stoss Landscape Urbanism; Elana Brescia, ASLA, and Kate Orff, ASLA, SCAPE; Gary Hilderbrand, FASLA, and Douglas Reed, FASLA, Reed Hilderbrand; Ken Smith, FASLA, Workshop: Ken Smith Landscape Architect; and Julie Bargmann, ASLA, D.I.R.T. Studio. Bargmann was one of the first, if not the first, landscape architect to be recognized with the award when she won in 2000. While she has since gone on to design many recognizable projects, such as MASS MoCa in North Adams, Massachusetts, and the Urban Outfitters Headquarters in Philadelphia, Pennsylvania, in 2000, she was best known for her work at the Ford River Rouge Plant in Dearborn, Michigan. 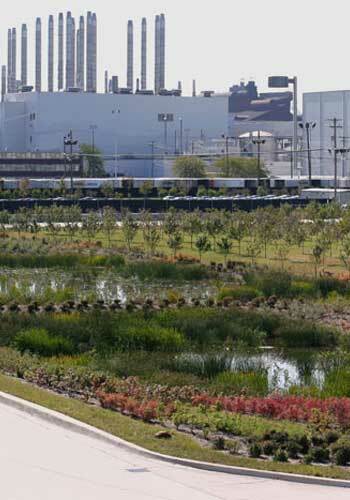 This regenerative project transformed an industrial icon into a model of twenty-first century sustainability through the use of ambitious ecological systems, creating “a new model of environmentally integrated manufacturing.” Bargmann is a true example of the kind of practitioner the award seeks to recognize — someone who has been a novel thinker from the beginning of her career and has made this innovation a career-long pursuit. The most recent landscape architect featured in the book is Susannah Drake, Dlandstudio, who was recognized with the award in 2013. Applauded for her unique voice in projects like BQ Green and Gowanus Canal Sponge Park, both in Brooklyn, New York, Drake has quickly proven that interdisciplinary design is the way of the future. Each of Dlandstudio’s projects emphasizes the integration of ecology, infrastructure, and design at the urban network scale — using the United States’ largest city as a primary testing ground for new ideas in a way few firms have dared to try. Focused on firms and individuals who have tested limits and pressed the design profession forward, rather than those who are solely focused on making names for themselves, 30 Years of Emerging Voices is a unique book in its genre, prioritizing innovation over recognition and setting the stage for design breakthroughs to come.